I have to be honest: I’m not the world’s biggest Angelina Jolie fan. I find her cold and severe looking, too rail-thin, and just not as hot as some other men do. (TMI, perhaps?) 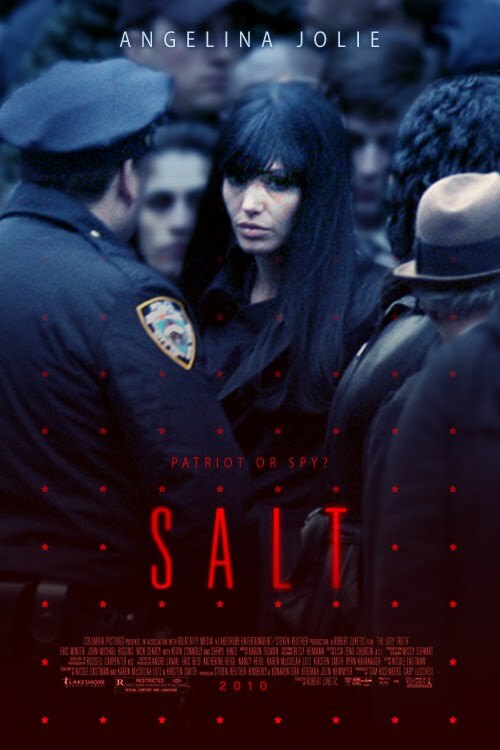 Her new film Salt doesn’t exactly turn the tide for me. Here, Jolie plays a CIA agent who may or may not be a Russian spy. For the first half of the movie, I really didn’t care which side she was on. Her character didn’t engender much sympathy. And then, predictably, there’s a twist, but it doesn’t exactly make her more sympathetic — even though it’s probably supposed to. Salt has some decent stunts, a good chase scene or two, and Andre Braugher in a really random blink-and-you’ll-miss-him supporting role (seriously, what was the point of that?? ), but it’s just an average summer flick that thinks it’s more but really is just alright. You’ll have forgotten it by the next morning. I’m giving Salt a B–.